“I found one,” a small voice said among the rows and rows of berries on a recent Wednesday morning. “It is juicy?” another responded. Juicy it may have been, but more important to the kids was pointing out the red juice from the freshly-picked olalieberries running down their fingers. “It looks like blood,” 8-year-old Zoe said. Her key to finding the perfect berry is by examining the color. Zoe was one of the people wandering around Phipps Country Store and Farm in Pescadero picking berries. Cooking is a wonderful way to introduce your children to a variety of food. But kids may not put together where the food came from. Are berries endlessly available at the neighborhood grocery store? If not, how do they get to the store? The farm offers a chance for families or individuals to wander around, see the animals, buy fresh produce and even hand pick berries. Olaliberry, pronounced oh-la-leh berry, season is soon ending, but the tart berries are still available. Simply wandering the fields can offer a great lesson. The vines aren’t always green. Color of the berry can greatly change the berry’s flavor. In the instance of the olaliberry, darker is better — a little too light and watch for the super sour face! The process isn’t too difficult. After a beautiful, coastal drive to Pescadero, pull into the farm and pick up a small bucket and a liner. Ask for advice on looking for the perfect berries. These tart, sweet and juicy berries were developed by the U.S. Department of Agriculture of Oregon State University in 1949 by crossing a Loganberry with a Youngberry. Despite being developed in Oregon, the cross between a blackberry and a red raspberry is primarily grown in California. In San Mateo County, the berry is most known in pie form served at Duarte’s Tavern, which visitors to the farm will pass before arriving. Opened in 1894, olaliberry pie is one of the restaurant’s specialties. To make your own at home, start with picking the main ingredient fresh. Preheat the oven to 425 degrees. Combine 6 cups of olaliberries with 3/4 cups of sugar (maybe more if the berries are really tart), a pinch of salt and juice and zest from one lemon. Taste for sweetness. Add 3 tablespoons minute tapioca and let sit for 15 minutes, according to a recipe by www.tastebook.com. Line a 9 inch pie plate with dough rolled out to 14 inches, letting the dough hang over the rim of the plate. Fill with the berry mixture, smooth the edges and dot with butter (It should take about 2 tablespoons of butter cut into small pieces). Cover with a second piece of dough. With a pair of scissors, trim the dough so it extends an inch beyond the rim of the plate. To seal, fold dough under so it sits on the edge of the plate. Pinch into a decorative border. You can crimp with a fork. Whisk 1 egg yolk with 1 tablespoon of milk to create an eggwash which will be brushed over the dough. Sprinkle the top with sugar. With a sharp knife, cut a few vents into the dough. Bake for 25 minutes at 425 degrees. Reduce to 250 degrees, place pie onto a baking sheet, then bake an additional 30 minutes. You’ll know it’s done when the crust is dark and the olaliberry juice is bubbling through the steam vents. The country store at Phipps opened in 1978 as an old garage building with a dirt floor, picnic table countertop and a cigar box for keeping the cash. It allowed the children to sell produce, and kept them busy during the summer, according to the farm’s website. Today the store has a bean room, herb and spice room and a plant nursery. A variety of farm animals and birds live just outside the store year round. 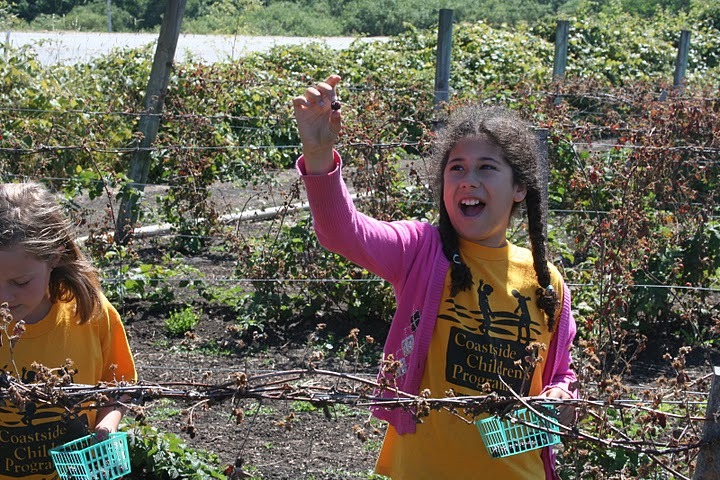 Anyone who visits has access to enjoy the various aspects of the farm, including berry picking. The Phipps Country store is located at 2700 Pescadero Road in Pescadero. From the north, take State Route 92 toward Half Moon Bay. Once in Half Moon Bay, take a left on Highway 1 south. Continue on Highway 1 for about 17 miles. Turn left onto Pescadero Road. Follow Pescadero Road into town, about 1 to 2 miles. You will come to an intersection that has a small market/gas station on the corner. Do not turn here. Continue straight for about 1 miles on Pescadero Road and you’ll see a sign on the right side that reads, “Welcome to Phipps.” Park in the lot to the right of the store. The store is open 10 a.m. to 6 p.m. daily through October. It’s $3 per person, for individuals 5 to 59 years old, to enter the farm. Each pound of berries is an additional $3. Awesome article! Very informative, keep up the great work!